Another edition, another starter set. If 5e is an attempt to bring back all the edition war casualties to the D&D homeland, then arguably, the starter set should sit outside of those considerations right? After all, it’s primary purpose is to attract new blood into the hobby. Except, it isn’t. I am just guessing here, but I suspect the core demographic that buys the starter sets are already hobbyists. They may be as presents for nieces and nephews, or just as nostalgia, or more likely out of a sense of completion and an opportunity to get hold of the rules as an early adopter. Certainly, the new starter set doesn’t appear to be made with novices in mind, but for lost gamers coming back for anger look at the old girl to see what’s up. With 4e there was an attempt late in the day to make a product designed to teach the game, the new Red Box as part of the Essentials line. It had a retro cover to lure back the (by now) dads and uncles, but it also made a good effort to show a solo purchaser how to play D&D from scratch. Little wonder the existing fan base slated it for not going beyond level 2 or for only being 99% compatible with core 4e. It suffered by comparison with the original Mentzer red box, and/or the Moldvay red book that millions of gamers got started with. Useful to remember then that those old school sets were named ‘Basic’ and that the current WotC proposition suborns that name for another thing entirely: a limited option but otherwise complete text of the full bore game. Let’s see what the new starter set contains. You get a dice set, some pregens, the rules in 32 pages, and an adventure that goes to level 5 called Lost Mines of Phandelver. Now, it’s not that there aren’t some nods to the brand new player within, there are. But overwhelmingly this is an introduction to 5e for those who have some past knowledge of D&D (or other RPGs) or more likely, a handy DM who expresses a desire to try the new edition. I should know, I bought it for that very reason! My players preferred to use the Basic rules available for free online to generate their characters (fair enough), and I used the same to learn the rules. The dice were handy, but really my money all went on the adventure and a big old cardboard box. The adventure is fine, good even, though 1-5 doesn’t last as long as it used to. The first two levels are really a tutorial so you’re getting no more play than you would get out of, say, Keep on the Shadowfell. Now there’s a lamented adventure! Hard to remember now, but that was the launch product for 4e, and it contained the basic rules of play too. In fact, lose the dice and the box, add a card sleeve and you’ve got a very similar product. Amazing what a bit of trade dress can do to alter appearances. This adventure got me started on a four year campaign, so it can’t have been all bad, and it taught 6 players the game too. We enjoyed it, but as I say, I think is was a starter set only for me, as an experienced DM, looking to get a group together. For me, the current starter, and so many others, fails as a tutorial on the game. And I’m fine with that, and so I suspect are WotC (and Paizo, whose Beginners Box gets a lot of well deserved praise, from it’s existing fanbase). I don’t really think that raw text and pictures are ever going to do that good a job of teaching anyone how to play from a cold start. You need your hand holding. You need guidance, from either a real person or a well organised website. No matter what you put in a box, you need that extra step. What you could do, and what I would do, is make multiple jumping on points for the hobby. 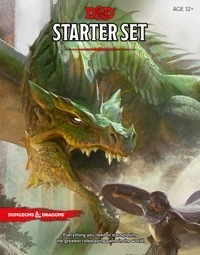 Instead of ‘starter set’, I’d release a series of starter sets with their own names. I’d package the recent one differently. Lose the box, put in plastic, like a big blister pack you can see through. Have it able to hang from a shelf hook, or stack. Keep the dice, and the pregens, put the adventure rig at the front. Now it’s the Lost Mines Starter Set. Include rules, even more stripped back than they are, and chuck in loads of promo that leads you to the WotC site. Then, put that process on delayed repeat. Every few months put another one out. The Tomb of Horrors Starter Set (with black dice). The Autumn Twilight Starter Set (with red ones). The Vault of the Drow Starter Set (with purple ones). Make it all about the adventure, not the rules. These concepts already exist, and close to home too. First, How to Host a Murder Mystery. Many boxes, all of them contain the rules of play, but the meat and the hook is the adventure. Even closer? Magic: the Gathering. The rules are fine tuned down to a booklet by this point, and are available freely online. The sets (the story really) are the draw and there’s multiple ways to get involved. The whole core fat pack experience is there for the veteran, but the toy shops are full of prepackaged duelling decks, or colour themed starters. It’s exactly the same for Pokemon. Lastly, the board games that WotC went with over the last couple of years, with Castle Ravenloft, Wrath of Ashardlon and Legend of Drizz’t. 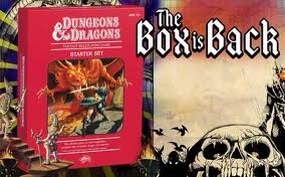 Notice how you didn’t buy a Board Game Core box and then separate adventure boxes to go with it? That’s what I would have in the mass market. Standalone adventures, with enough rules to play that particular one, and clear directions to the rest of the hobby from there. In disposable packaging that shouts ‘start here’. Just like…. Fighting Fantasy books.